Removal of metabolic waste products such as uric acid, urea and creatinine. Maintain electrolyte, water and pH balance. Regulation of blood pressure, blood volume and erythropoiesis, and vitamin D production. Development of the urinary system is closely related to the development of the reproductive system; particularly during the earlier stages – where they develop from the same origin. However, the urinary system develops ahead of the reproductive system. 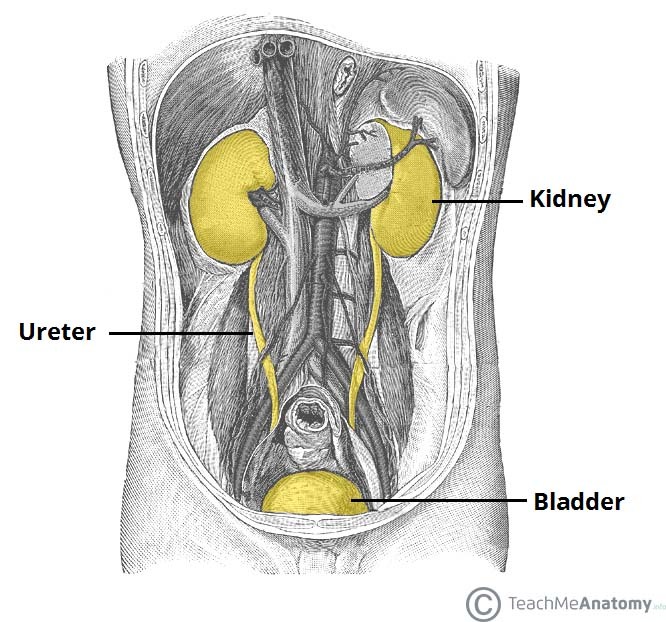 The urinary system consists of the kidneys, ureters, bladder and urethra. A region of intermediate mesoderm, known as the urogenital ridge, gives rise to these structures. In this article, we will look at the embryology of the urinary system and its clinical correlations. Fig 1 – Overview of the developed urinary system in adults (urethra not depicted). 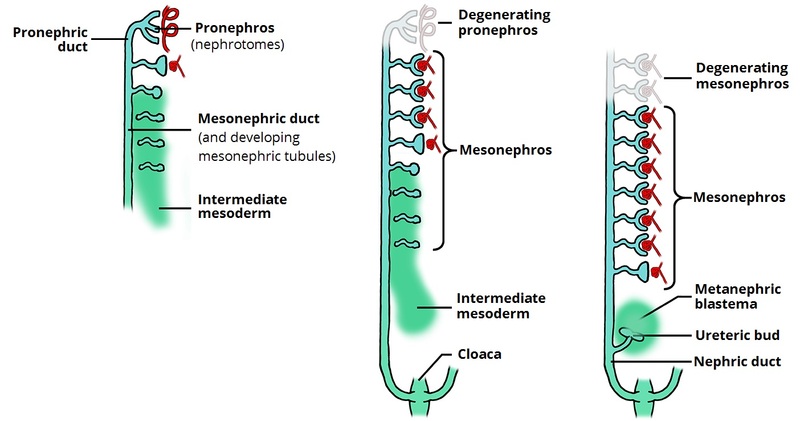 In the embryo, the kidneys develop from three overlapping sequential systems; the pronephros, the mesonephros, and the metanephros. They are all derived from the urogenital ridge. The pronephros appears in the 4th week of development. Its development begins in the cervical region of the embryo. Segmented divisions of intermediate mesoderm form tubules, known as nephrotomes. In total, 6-10 pairs of nephrotomes are formed. These tubules join into the pronephric duct, which is a duct that extends from the cervical region to the cloaca (distal end) of the embryo. This early system is non-functional and regresses completely by the end of week 4. The mesonephros develops caudally (inferiorly) to the pronephros. First, the presence of the pronephric duct induces nearby intermediate mesoderm in the thoracolumbar region to form mesonephric tubules. These tubules receive a tuft of capillaries from the dorsal aorta – allowing for the filtration of blood – and they drain into the mesonephric duct (a continuation of the pronephric duct). They act as a primitive excretory system in the embryo, with most tubules regressing by the end of the 2nd month. 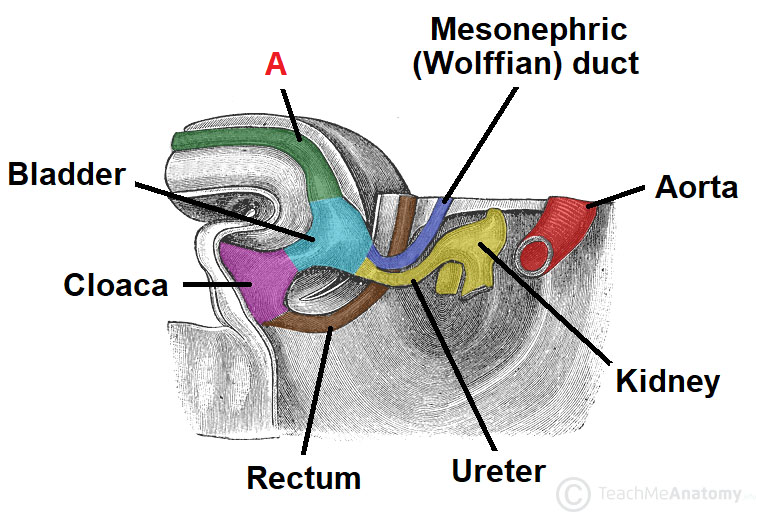 Additionally, the mesonephric duct sprouts the ureteric bud caudally, which induces the development of the definitive kidney. The metanephros forms the definitive kidney. It appears in the 5th week of development and becomes functional around the 12th week. Collecting system – derived from the ureteric bud. It dilates to create the ureter, renal pelvis, major and minor calyces and collecting tubules – terminating at the distal convoluted tubule. If the uretic bud splits too early, two ureters, or two renal pelvices connecting to one ureter may result. 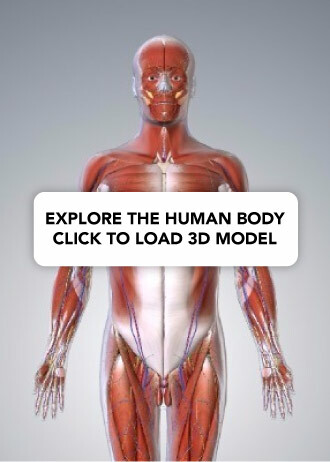 Excretory system – derived from the metanephric blastema. Each collecting tubule from the collecting system is covered by a metanephric tissue cap which gives rise to the excretory tubules. These excretory tubules (along with the developing glomeruli) form the kidney’s functional units – the nephron. The definitive kidney initially develops in the pelvic region before ascending into the abdomen. In the pelvis, the kidney receives its blood supply from a pelvic branch of the abdominal aorta and as it ascends, new arteries from the abdominal aorta supply the kidney. The pelvic vessels usually regress, but can persist as accessory renal arteries. A horseshoe kidney (also known as a cake kidney or fused kidney) is where the two developing kidneys fuse into a single horseshoe-shaped structure. This occurs if the kidneys become too close together during their ascent from the pelvis to the abdomen – they become fused and consequently ‘stuck’ underneath the inferior mesenteric artery. This type of kidney is still drained by two ureters, and is usually asymptomatic, although it can be prone to obstruction. The bladder and urethra of the urinary system are ultimately derived from the cloaca – a hindgut structure that is a common chamber for gastrointestinal and urinary waste. Fig 3 – Model of an embryo at 32-33 days old. The upper part of the urogenital sinus forms the bladder. The pelvic part forms the entire urethra and some of the reproductive tract in females, and the prostatic and membranous urethra in males. The phallic/caudal part forms part of the female reproductive tract, and the spongy urethra in males. The urinary bladder is initially drained by the allantois. However, this is obliterated during fetal development and becomes a fibrous cord – the urachus. A remnant of the urachus can be found in adults; the median umbilical ligament, which connects the apex of the bladder to the umbilicus. As the kidneys ascend into the abdomen, the ureteric openings move cranially. 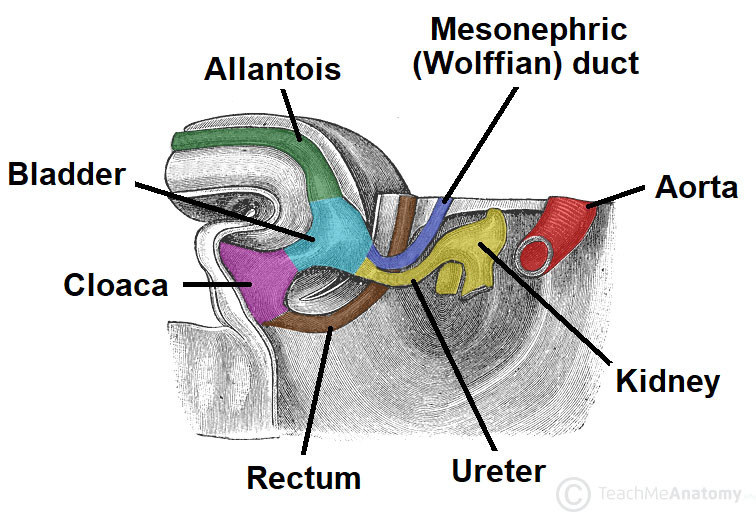 The mesonephric ducts (Wolffian ducts) move caudally and closer together, entering the prostatic urethra to become the ejaculatory ducts. The mesonephric ducts degenerate due to a lack of testicular androgens. The pre-prostatic, prostatic and membranous urethra is formed from the pelvic part of the urogenital sinus. The spongy urethra is formed from the phallic part of the urogenital sinus. In the embryo, what is the first kidney system to develop? Which of the following components of the kidney is derived from ureteric bud? Below is an illustration of the developing urogenital system at 32 days. Which structure corresponds to ‘A’?